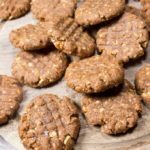 We’re all about back to basics today with this fabulous 4 ingredient low carb peanut butter cookies recipe! To make keto peanut butter cookies, you need NO SPECIAL EQUIPMENT. In fact, you can mix the dough in a bowl with a fork. And then lick it (the fork). See? No labour-intensive cleaning of blenders/food processors = more fun! All ingredients go in as-is, and in any order you like. Some cookie recipes require that you beat egg whites stiff, or that you mix your dry ingredients before adding the wet and if you don’t – you might as well start again. Here, you throw in your 4 ingredients (or 5, if you want to add cinnamon) in any order you like. YOU JUST CAN’T GO WRONG. Guys, this recipe is easy on the brain. 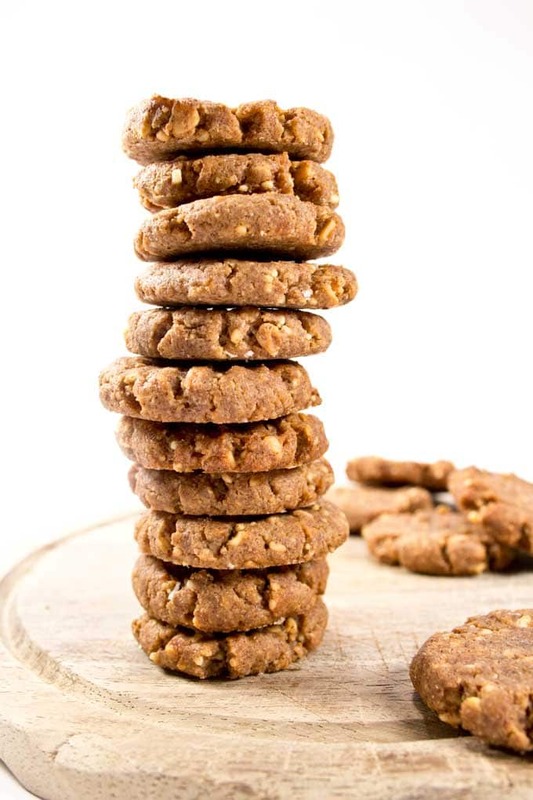 You’ll love these absolutely delicious, chewy-crunchy Keto peanut butter cookies – and your family will never guess they’re low carb and sugar free! The ONLY ever-so-slightly challenging part of this recipe is the creation of those pretty criss-cross markings on top of the cookie. Naturally they are not essential at all, so if you cannot be bothered, by all means, don’t. But if you want to post your cookies on Instagram, wow your crowd or just feel up to it, wet your fork before you get going and clean/wet again as you work your way through the batch. This prevents the cookie dough from sticking to the fork. BAKER’S TOP TIP: If you want a cookie that’s soft in the centre, bake for around 8 minutes. If you prefer a crunchy one, leave it in the oven for 10 minutes. The cookies will be soft when freshly out of the oven. Patience!!!!!!!! They firm up as they cool down. Always check the label! Often, brands add palm oil and sugar. Here in the UK there are several brands that sell peanut butter that contain only one ingredient – peanuts. Try the Meridian brand in the UK or Whole Earth in the US. If you have a food processor, you could even make your own peanut butter. Simply blend the peanuts for a few minutes on high speed until the peanuts release their natural oils and you have a smooth butter. Add in some crushed peanuts for crunchy peanut butter. 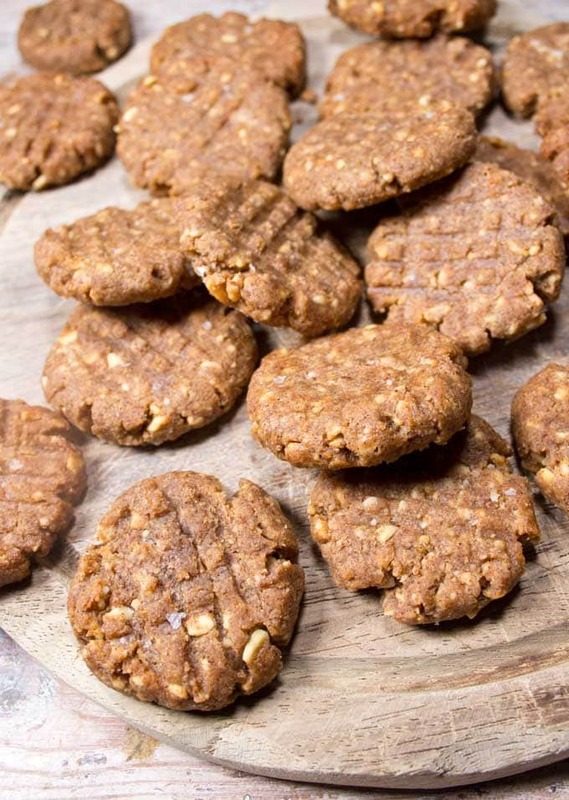 This keto peanut butter cookies recipe is easily customisable. You could add sugar free chocolate chips, for example. Dip one half in melted chocolate. Or use smooth peanut butter instead of crunchy. If you love peanut butter as much as I do, you should definitely also check out this chocolate peanut butter freezer fudge. Equally simple and equally delicious. Fun fact – did you know a peanut is not a nut but a legume? True story, but really. In my book, peanuts are welcome to live alongside almonds, pecans and the like. Let a nut be a nut. These flourless Keto peanut butter cookies are ready in no time at all! 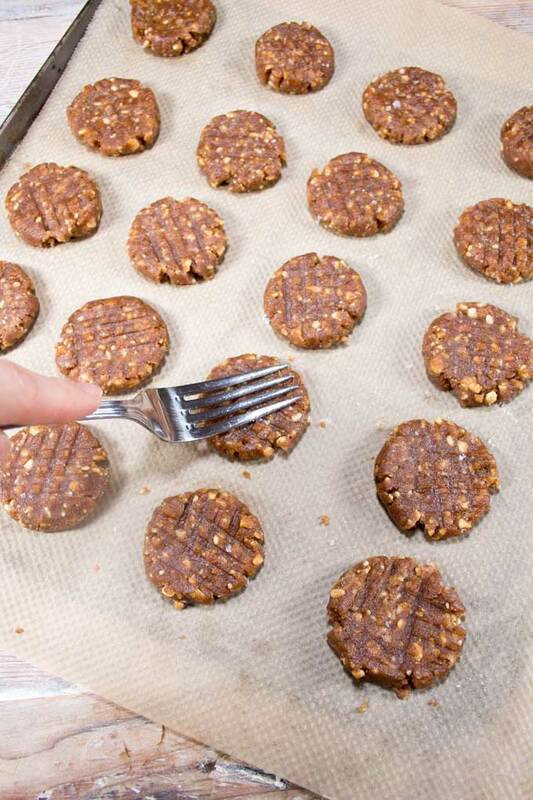 All you need for this super simple low carb cookie recipe are 4 ingredients. Put all ingredients in a bowl and mix with a fork. Roll small balls of dough (ca 15g each) with your hands (or use a small cookie scoop) and flatten them on a baking sheet. Wet a fork and press on cookies to create a criss cross pattern. Let cool completely before eating. 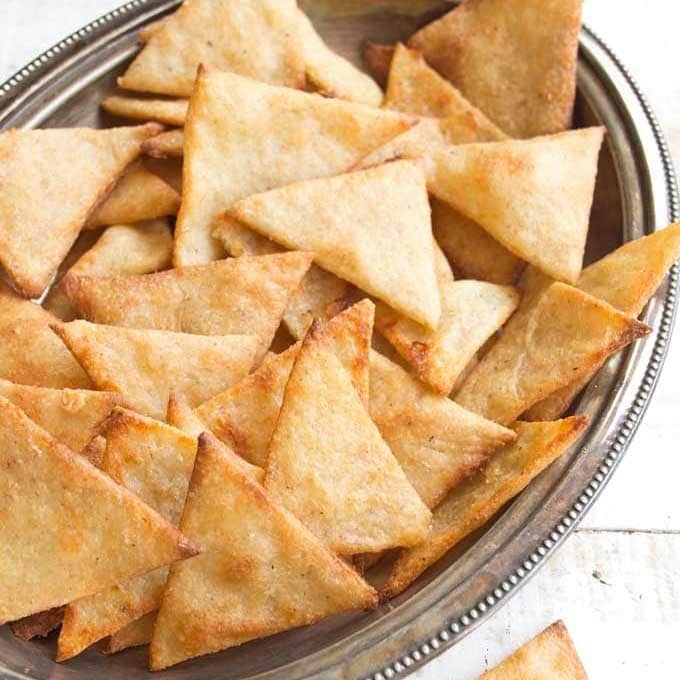 They are very soft when just out of the oven, but will become crunchy once cooled. Try getting hold of a peanut butter that contains 100% peanuts and nothing else. If you have a food processor, you can even make your own. I mixed a bit of sea salt into the dough and sprinkled a bit more on top. It's the salted caramel effect - sweet and salty together are just crazy good. Wonderful recipe. Puzzled however, if we use sugar, coconut sugar, maple syrup, or honey etc, the carb count goes up through the roof! Not Keto. I only have stevia drops -and I note you commented that perhaps they would not come crunchy. What if I add a little almond flour, just enough to make it crunchy? 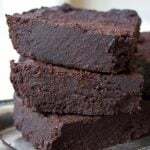 Hi Vivian, the recipes uses erythritol, which is a zero carb sweetener. It’s my favourite low carb sweetener and I prefer the taste over stevia. You could use stevia though, of course, and I think adding a little almond flour to make up for the missing bulk of the sweetener would be a good idea. How much would depend on how runny or firm your peanut butter is! Made my 1st batch tonight, just on day 3 with the keto plan and I was going mad for something sweet. These are brilliant cookies and just right to curb a sweet craving. Just made the blueberry and raspberry jams and the rustic bread. Cravings sorted. This is an amazing site, definately my go to place. Have made 4 times now and they are my “go to” cookie. So fast, so easy. I also do mine with a few flakes of Maldon sea salt on top….so yummy. Thanks for all the great recipes. Also love your breads and cakes. You have the golden touch with baked goods. Hi Louisa, I never count the erythritol in my recipes when calculating the nutrition because it passes through the body without being digested. glad you like the cookies!!!! That’s always the issue with desserts that are good – I know what you mean!!! I made these this evening but instead of making cookies I put the whole lot into a silicone cake mould and made one giant cookie (being lazy really) spread melted chocolate over the top once cooked then ate a piece once cooled. Tasted so good. Just what I needed to stop me eating non-keto biscuits so thank you. I got 12 pieces out of the mixture. The cinamon is just lovely. What a great idea! I’m all for saving time 🙂 I bet the chocolate was delicious on it. If I do not want to use any sweetner, can I proceed with the recipe less the granulated sweetener? Must I put an alternative or it would work as is? And if I were to sweeten them, and I do not mind adding a natural sugar source like honey, will that work? Thanks. You could replace with coconut sugar, that would be the easiest way to get the dry/wet ratio right. If you did not want to use any sweetener, make sure your peanut butter is on the firm side and not too runny. Then adding honey would work, too. You might have to scoop the cookies onto the baking tray instead of forming them with your hands, but they should firm up in the oven and end up just as yummy. Can I do this with almond butter instead? Absolutely! Any nut butter would work. I was very excited to try these & made them today. Unfortunately, I found them to be WAY too sweet! Next time I will try with 1/2 the sweetener. Do you think it will work as well? It should still work 🙂 It’s so funny, I’ve had a couple of people saying they were not sweet enough! We all have such different ideas of what’s sweet & what’s just right. Always best to try the dough before baking. Can I ask you what sweetener you used? No worries, next time they’ll be perfect then! Thanks for getting back to me! Hi Katrin, these cookies are just delicious. 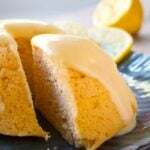 I thought they were just on the right side of sweet and couldn’t believe how easy this recipe is! Maybe you could try reducing the baking time? If they retain more moisture they should be less crumbly. Hi Carmen, of course it would. It’s not that common in Europe, that’s why I have not tried it yet. I hear it tastes great though. I am new to this low carb thing & with my sweet tooth it has been so hard to stay committed. I followed this cookie recipe using creamy peanut butter then added a touch more cinnamon. Not only did it satisfy my craving but I couldnt believe how filling it was! Love this & will recommend it to everyone I know!! Hello Stephanie, glad you enjoyed the cookies. 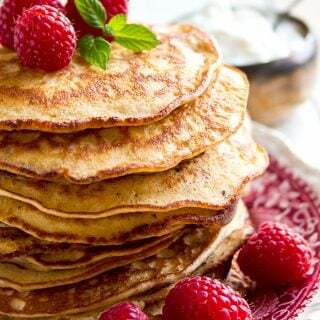 One of the best things about a low carb diet is that the foods are so filling and thereby rather satisfying. 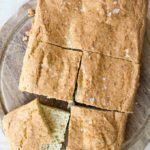 I noticed that you have many positive comments on this recipe, and probably don’t need one more, But I just have to add my 2 cents worth. I have made these twice now, both with my own homemade peanut butter ( just peanuts and a bit of sea salt). The first batch I did with just the peanut butter as I made it, as in mostly smooth in texture. They were pretty impressive if you ask me. The second batch I added some chopped peanuts to it. The cookies were harder to get to hold together in the balls, but the peanut taste really pops. Making your own peanut butter is so easy, I don’t know why I never thought of doing it before. Of course, before Keto, buying a jar of Jif was just a given! Hi Marijane, thanks for your comment! 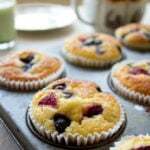 I love hearing how well my recipes work for others and how people customise them. You’ve just inspired me to make a batch of nut butter…yum. How many cookies is a serving and how many calories in a serving? 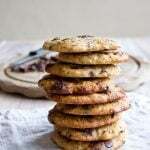 I calculated the nutrition for 1 cookie – it’s 78 calories. If you want to eat 1 or 2 or… up to you 🙂 They are quite filling! Can you substitute the sweetener for honey or dates? I’m sure you can! If you use honey, you might want to opt for a variety that’s not totally runny. You could also use coconut sugar. Maybe I moved them to the cooling rack too soon or cooked them too long. I was afraid they were not done because they were so mushy soft so I left them in a few more minutes. I ‘ll try another batch. Sure! Just leave them to cool completely and it should be fine! I made these with smooth all natural peanut butter because it’s what I had on hand. The cookies fell apart after baking. Has this ever happened when you bake them? Wondered if I needed some coconut oil or something. They just crumbled apart. Hi Amy, the cookies are really crumbly and soft when they are hot. I always wait until they cool down. When cold, mine were nice and firm. 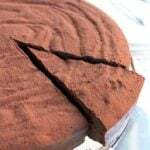 Were yours still crumbly when they were cold? 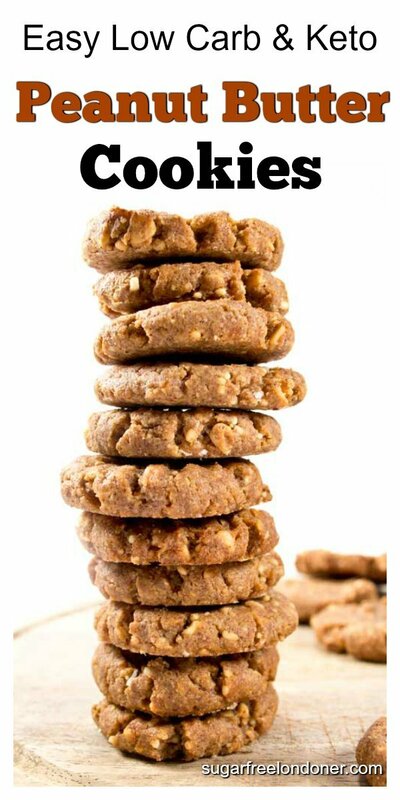 I don’t think your cookies need more fat – peanut butter is mainly fat on its own, and the egg helps to bind it. I made these today. Didn’t have enough peanut butter, so I added almond butter. I used half the amount of sweetener too. I used Pyure stevia and erythritol blend and added the cinnamon. I only got 15 so I made mine a little too large, but they were awesome! 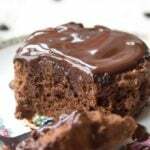 I will definitely make these again!! I’ve been meaning to try them with different types of nut butter. Mixing peanut and almond sounds great! If you get yourself the Sukrin Fibre Syrup, you just use that as the sweetener. You just have to stir the syrup and the peanut butter for a while, it comes together as a dough after a couple of minutes! MMMMh, adding vanilla sounds like a great idea! Have tou tried freezing these? How welldo they hold up? Crunchy, nutty, delicious. Love how easy they were to make! Could you use normal granulated sugar? Made these tonight. Added a teaspoon of dark chocolate and they were fabulous! Thank you. I’m kinda new to this whole carb counting thing so please forgive my ignorance. I am neither a chef nor a mathematician so could somebody explain to me where my carb calculations are off? 1 cup P.B. = 8 (2 TBSP) servings. then (6-2) = 4 carbs / servings, so the P.B comes to 32 carbs / BATCH. 1/2 cup sweetener = 8 TBSP = 24 TSP. with 4 carbs / TSP. (*) so I count 96 carbs there. So with the PB and sugar, I count 128 carbs in the batch, split to 20 servings I get 6.4 carbs/cookie. I do not count the carbs from the polyols in erythritol. We cannot digest erythritol, as we do not have an enzyme for it, so it passes through the body without sugar’s harmful effects. Most of it is passed out virtually unchanged through our urine, making it effectively 0 net carbs. Well this newbie appreciates your feedback. I knew to subtract fiber, but hadn’t indoctrinated myself as to the sugar alcohols. That makes about 100 carbs/batch difference in your recipe. Back to the kitchen with me then! Would Splenda be a good sugar substitute? I am going. To reduce the sweetener to a couple of tbsp. Then taste the raw dough. I cut sweetener to the bone. Any idea what the carb count would be if you used Kraft peanut butter? Do you think I can make this with stevia too? I think it could work with stevia powder. I’m not sure how crunchy you would get these if you used stevia drops. I’ve got all ingredients at home. Making them now! Love the huge cookie stack! I wish I could eat it right off my screen…. I don’t like peanuts. 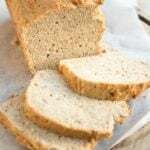 Do you think I can try this recipe using almond butter instead? I thank almond butter would work just as well as peanut butter. Haha, I thought that was me 🙂 Let me know how you get on! I made a batch yesterday using smooth peanut butter. So good. So glad you liked the cookies Catherine!